Cook rice in 1 cup of the water as directed on package. Cut tenderloin into 1/4-inch thick slices; cut slices into thin bite-sized strips. Meanwhile, heat 1 tablespoon of the oil in wok or 12-inch skillet over medium-high heat until hot. Add pork; cook and stir 4 to 5 minutes or until pork is no longer pink in center. Remove pork from wok; place on plate and cover to keep warm. Add remaining tablespoon oil to wok. Add onion and carrot; cook and stir 3 minutes. 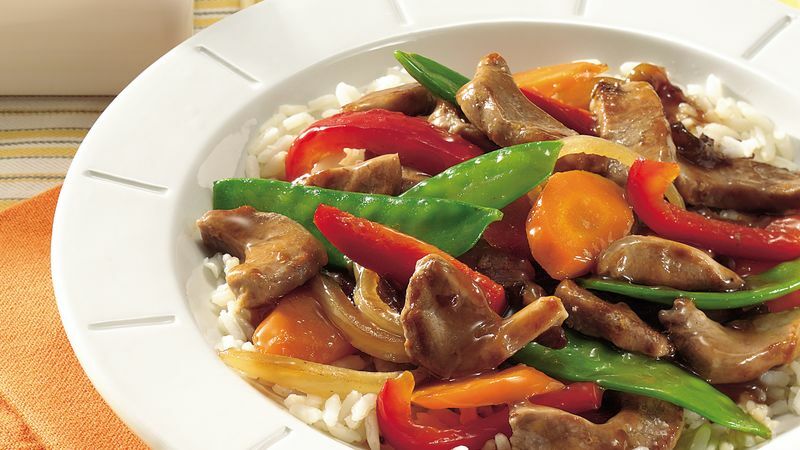 Add bell pepper and pea pods; cook and stir an additional 2 to 3 minutes or until vegetables are crisp-tender. In small bowl, mix jelly, soy sauce, cornstarch, ginger, salt and remaining 1/4 cup water until smooth. Add jelly mixture and return pork to wok; cook and stir an additional 2 minutes or until sauce has thickened. Serve over rice. Maui onions, from the Hawaiian Islands, are sweet, mild and white to pale yellow, and are in season from April to July. Walla Walla onions, from Walla Walla, Washington, are also yellow and sweet and are available from June through September. Try using an aromatic rice, such as Jasmine, Basmati or Texmati. These grains of rice have a wonderful perfume-like, nutty flavor and aroma.